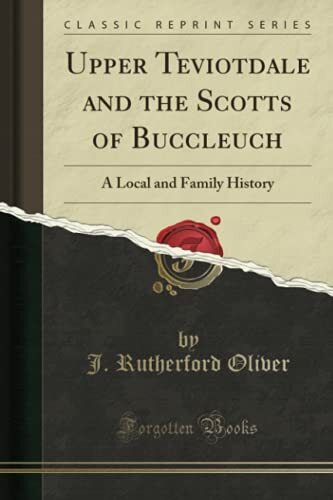 Excerpt from Upper Teviotdale and the Scotts of Buccleuch: A Local and Family History The district anciently known as Teviotdale, was not merely the vale of that classic stream, but comprehended the whole county of Roxburgh, from the Teed on the north - to the ridges of the Cheviot Hills-which form the boundary between England and Scotland; and from Teviot Stone on the west to Kelso on the cast; where the river, after following its winding course for thirty miles across the country, mingles its waters with the Tweed. About the Publisher Forgotten Books publishes hundreds of thousands of rare and classic books. Find more at www.forgottenbooks.com This book is a reproduction of an important historical work. Forgotten Books uses state-of-the-art technology to digitally reconstruct the work, preserving the original format whilst repairing imperfections present in the aged copy. In rare cases, an imperfection in the original, such as a blemish or missing page, may be replicated in our edition. We do, however, repair the vast majority of imperfections successfully; any imperfections that remain are intentionally left to preserve the state of such historical works.